Rivaldo has warned his compatriot over his stoicism at the Camp Nou last night. Phillippe Coutinho responds to his critics at Barcelona. 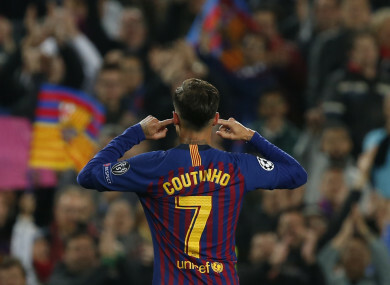 PHILLIPPE COUTINHO SHOULD not have gestured to the Barcelona fans as he did after scoring in Tuesday’s victory over Manchester United, according to Rivaldo. Barca booked their place in the Champions League semi-finals with a 3-0 win over United at Camp Nou, and Coutinho completed the scoring with a fine 25-yard strike after Lionel Messi’s first-half double. “It was not a good gesture. He scored a great goal, but it’s never good to do something like that to the fans,” Rivaldo told Marca. The supporters criticise him because they know he has to give more. I don’t know what happened to him during the week, what he read in the newspapers or saw on television, but you have to keep working, think about the next game and score goals. Coutinho arrived from Liverpool in January 2018 in a move that could reportedly cost up to €163 million (£142million) and Rivaldo urged his compatriot to keep plugging away at Camp Nou. “I would stay. He is a great player who cannot leave without being a Barcelona success because things haven’t gone well,” he said. He added: “He was a very expensive signing. Barcelona paid a lot of money for him and he is still not an idol of the fans. He must have more personality to make a difference. Coutinho may face a reunion with his former employers in the semi-finals, with Liverpool leading Porto 2-0 ahead of their second leg clash tonight. Email “Brazilian legend criticises Coutinho's Champions League celebration ”. Feedback on “Brazilian legend criticises Coutinho's Champions League celebration ”.